In our culture, showing emotion is the same as showing weakness. It's actually the opposite. People who can show their feelings to the whole world are actually quite strong. It takes strength to go against the grain of our culture like that. Yeah, not everyone in the world will approve of who you love to spend time with, but screw them. You don't have to be ashamed of the people you enjoy being around the most. Not all of us have glamorous jobs, that's for sure. It doesn't matter if you're the lowest rung at some awful corporation - you have a job and you're working hard. That's not something to be ashamed of. It's hard to do, but forgiving people is a beautiful thing. Society puts a great deal of emphasis on staying mad and holding grudges. It's ridiculous. Don't fall for it. Don't be ashamed to forgive and forget. In this world, hope is often seen as inherently stupid. It doesn't feel like there's very much hope out there for much of anything. But if you don't let yourself feel hope, who will feel it for you? Be a beacon of light in a dark world. Our pasts are what build us as people. 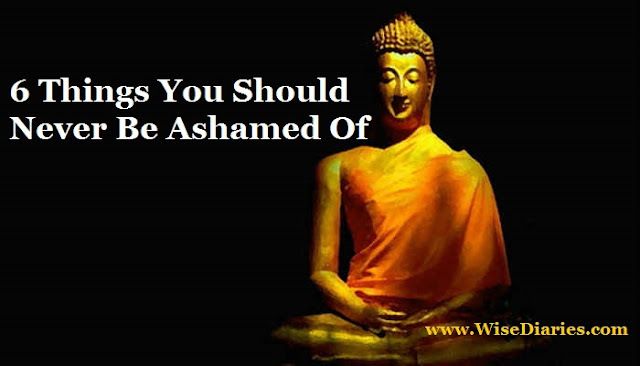 You shouldn't have to feel ashamed of stupid things you might have done in the past. Acknowledge them, let them grow you as a person, but don't dwell on it. This post was republished from e-buddhism.com. You can find the original post here.